The final results for the 2018 State of the CF Union survey are out. Thanks to over 460 CFers who filled it out this year. 1. What version of CFML Engine do you use? 2. What type of CFML Engine are you running? 3. What CF Server OS are you using? 4. 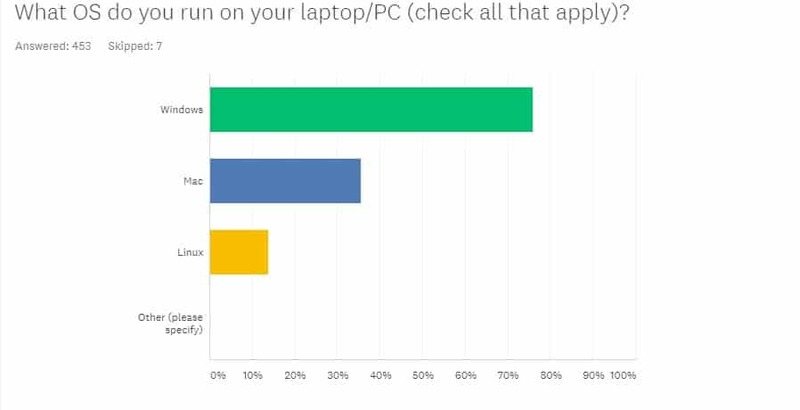 What OS do you run on your laptop/PC? 5. 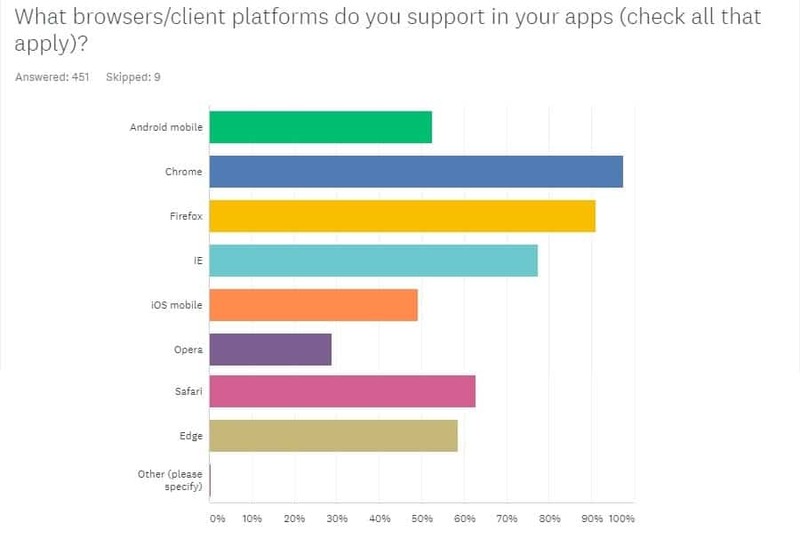 What browsers/client platforms do you support in your apps? 7. What code frameworks do you use? 8. What CF-based CMS do you use? 10. What CSS frameworks do you use? 11. What CFC dependency injection frameworks and tools do you use? 12. Which persistence frameworks do you use? 13. What testing and mocking frameworks do you use? 14. What type of CF Mobile development frameworks are you using? 15. What miscellaneous frameworks/tools are you using? 16. What CF features do you use for code reuse? 17. What do you use for source code control? 18. What tools/IDEs do you use? 19. What Browser Dev Tools do you use? 20. What do you use to build REST APIs? 21. What caching solutions are you using? 22. How many years have you used CFML? 23. 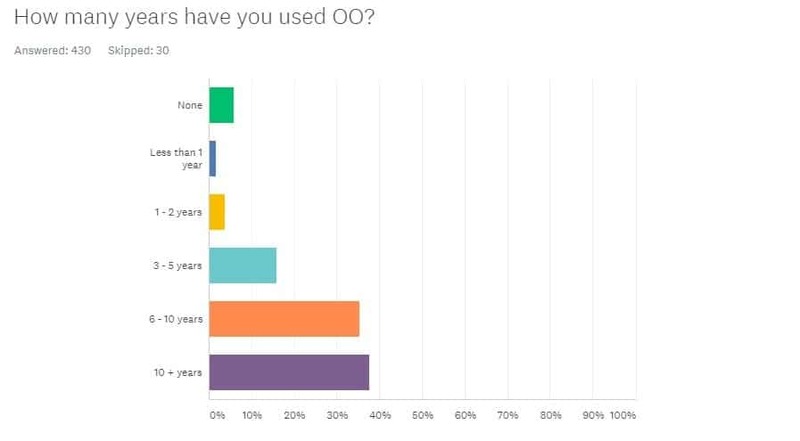 How many years have you used OO? 24. Other languages/environments you use? 25. How many CF developers at your organization? 26. 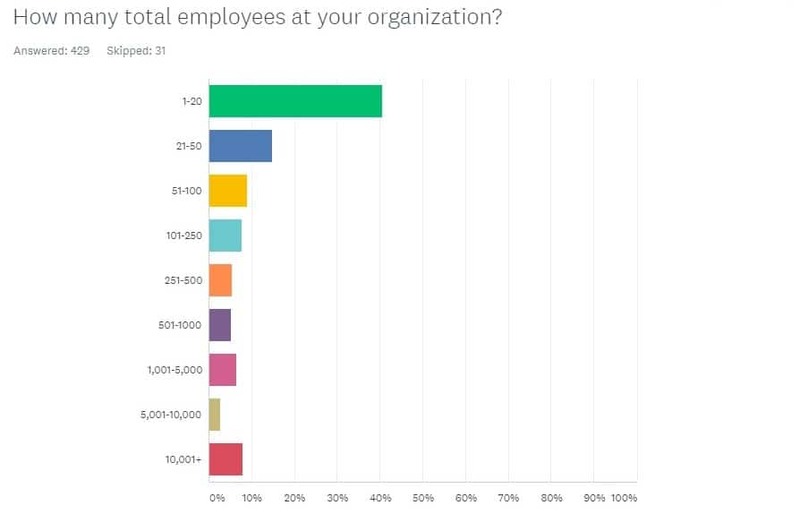 How many total employees at your organization? 27. How often do you attend ColdFusion User Group meetings? 28. Which conferences will/did you attend this year? 29. What online CF communities do you participate in? 31. What types of DEVELOPMENT setups do you use? 32. What types of PRODUCTION deployments do you use? 33. What hosting services do you use for your PRODUCTION deployments? 34. What Docker Image are you using, if applicable? 35. What deployment/build tools do you use? 36. What monitoring tools are you using? 37. How do you lock down your servers for security? 39. What aspects of CF are keeping you and/or your company using it? 40. What aspects of CF are preventing you or your company from embracing CF? 42. What is your current arrangement for CF work? 43. 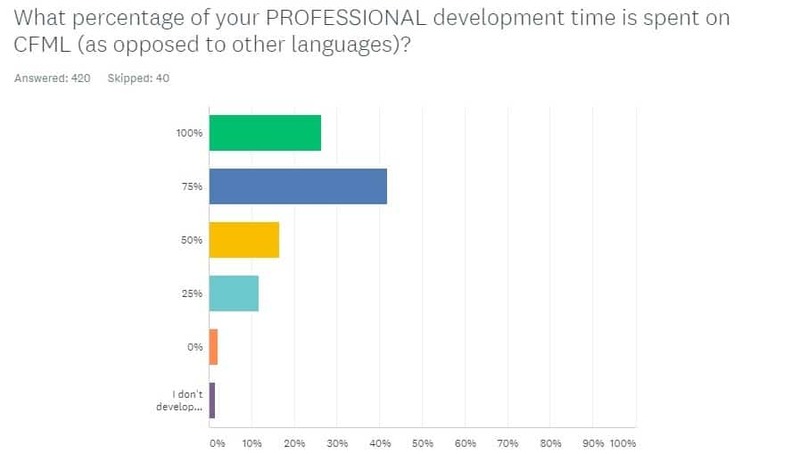 What percentage of your PROFESSIONAL development time is spent on CFML (as opposed to other languages)? 44. 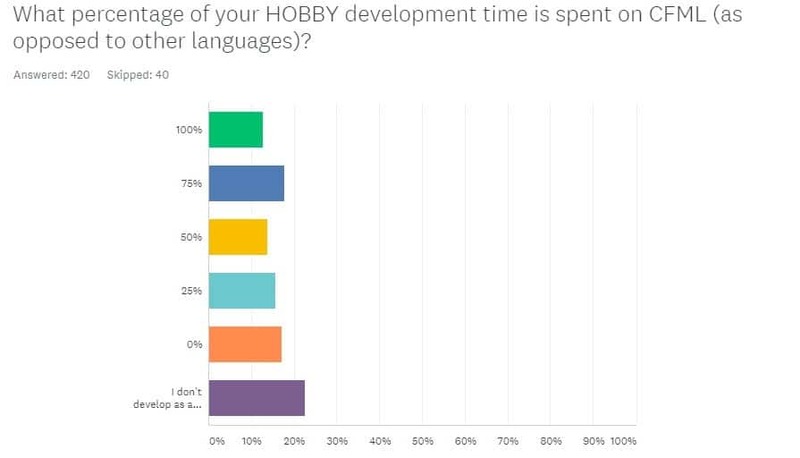 What percentage of your HOBBY development time is spent on CFML (as opposed to other languages)? 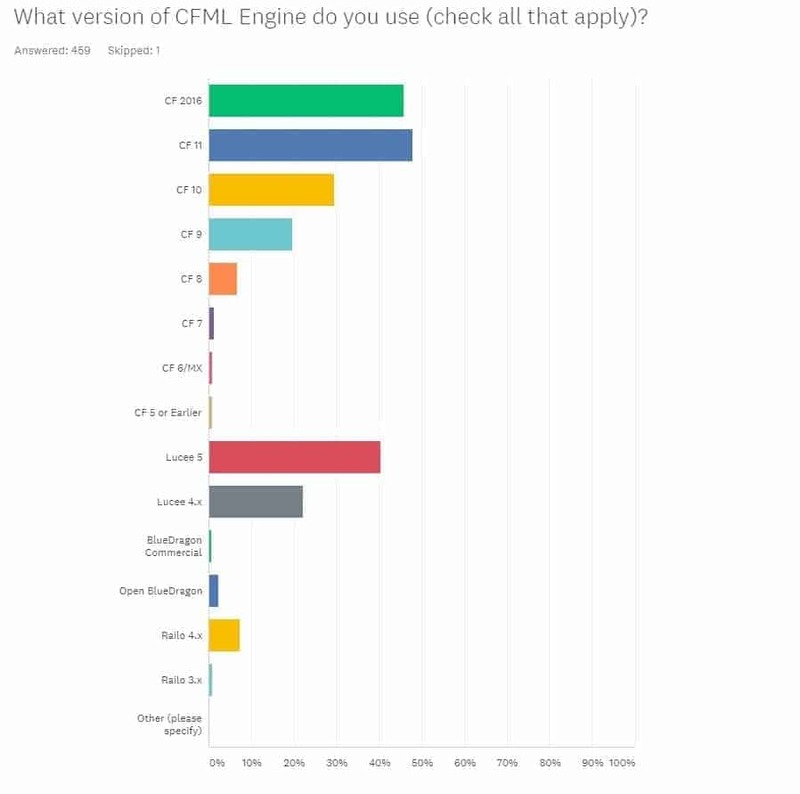 Surprisingly the four year old CF 11 is still the most popular CFML engine at 48.05%. CF 2016 is catching up in second place with 45.89% votes. ColdFusion 9 users still continue to shrink in numbers, as it has been for the past two years. Lucee 5 still has loyal users, as we have noticed from last year, it is more popular than CF 10. I highly recommend that if you are using CF 10 or early that you upgrade to a newer version. Because these Adobe versions are end of life and no longer get security or bug hotfixes. If you can't afford a new ACF license then consider the free Lucee open source CFML engine, which is also getting security fixes. This result is almost the same as last year's with most CFers using CF Enterprise version. Note that Lucee CFML only has one combined version, so that probably accounts for the N/A answers. Most ColdFusion developers use Windows as their CF Server OS. Linux is in respectable second place. As mentioned last year, Windows is probably unique to the ColdFusion and .NET environments. There is still a chunk of people using Macs as their hosting server, although the number is slightly less than last year. It is almost expected that a big chunk would be Windows for this, because of the operating systems that Adobe supports with CF Builder. Still, there are plenty of CF devs using Linux probably because of it having more options and good security. The results on this is exactly the same as last year, according to their ranks. Chrome still has the most users at almost 100%, while Firefox being the second, followed by Internet Explorer and Safari. SQL Server still has the most users this year, same with the 2017 survey. This is not surprising as SQL Server is a common pairing, and a lot of the government uses a ColdFusion, especially with Windows-based hosting. MySQL is still the most common open source database. There are still a chunk of CF developers who do not use any code framework. 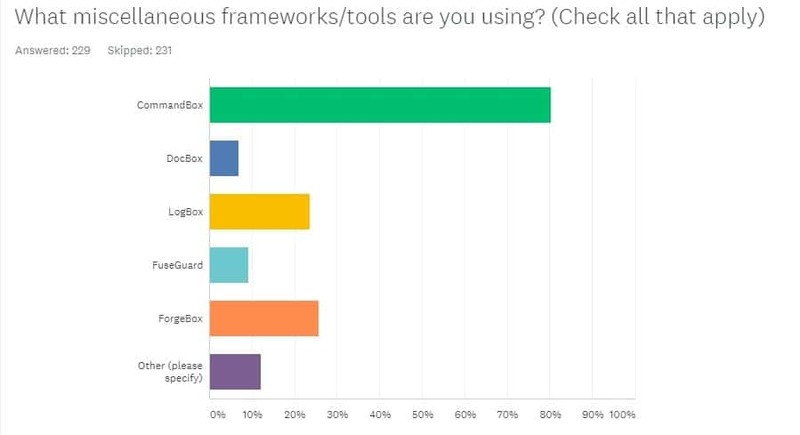 Most ColdFusion developers use a custom homegrown framework. 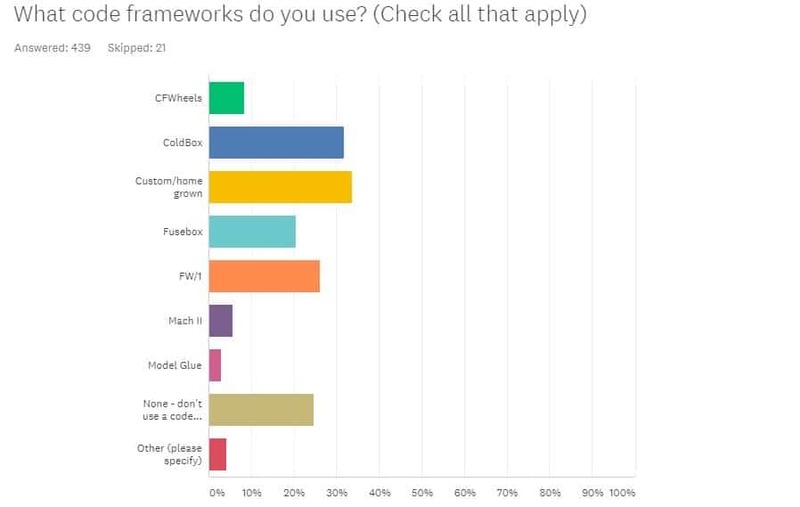 ColdBox wins as the most used code third party framework, with FW/1 and Fusebox coming in second and third respectively. 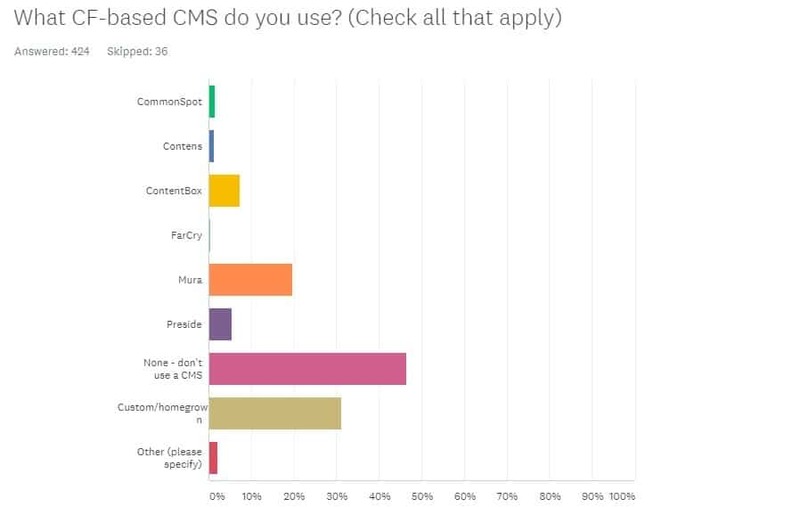 Again, a lot of ColdFusion developers do not use a CMS (Content Management System) at all. This is the same as last year's results. There are a lot of homegrown CMSs in the ColdFusion space. The most popular off the shelf ColdFusion CMS is Mura. With ContentBox in distant second place. Both are open source. Commerical CommonSpot and the German Contens are bring up the rear of this years CMS pack. 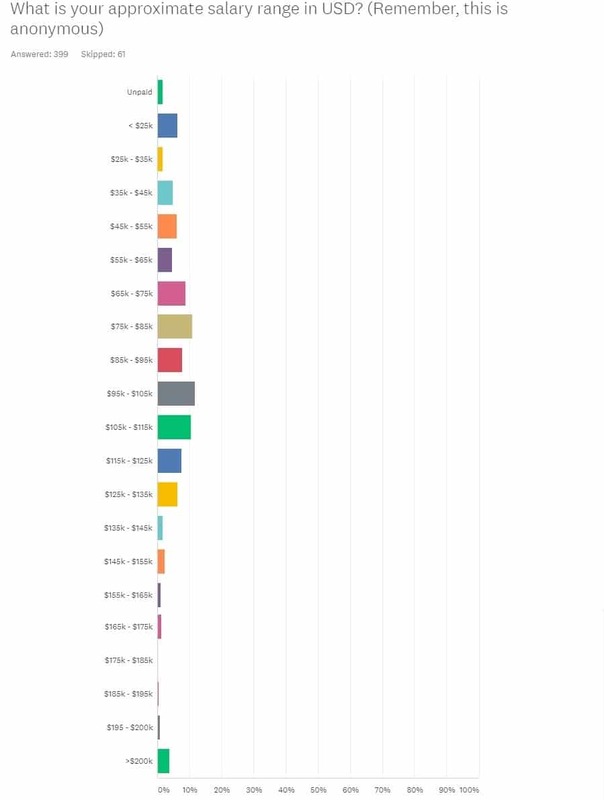 JQuery wins again, having the most CF devs using it this year. 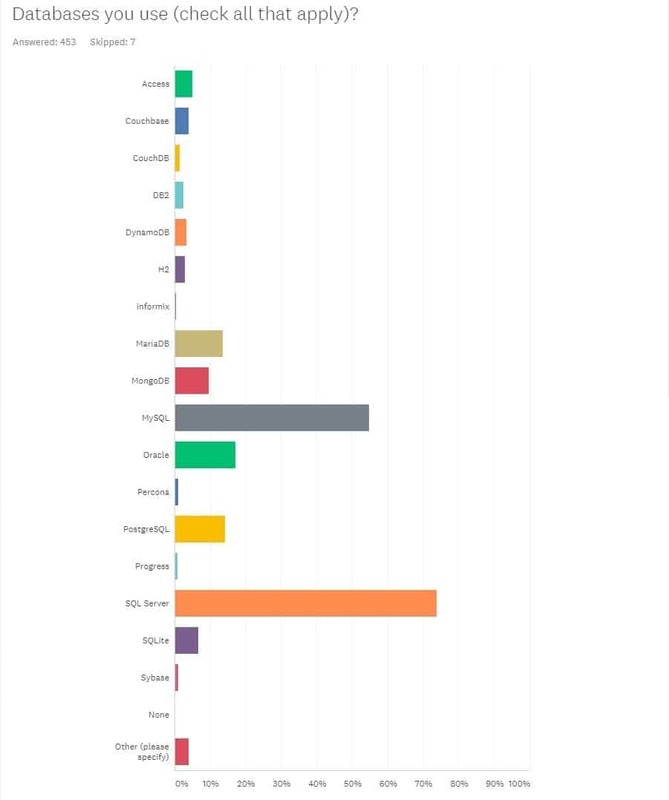 Angular JS 2 gained more users, while Angular JS 1 is at 3rd place this year. Vue.js just beats out React for fourth place. 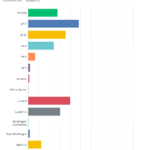 Bootstrap wins the most popular CSS framework used by CFers with 81% of votes. 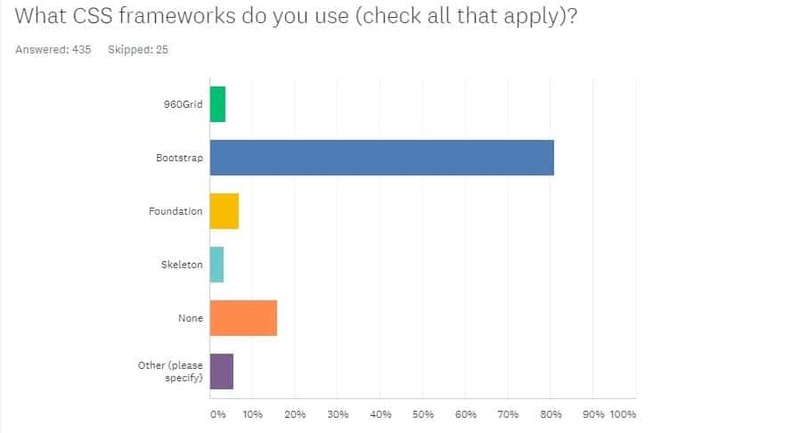 However, the results show that not everyone uses Bootstrap. 17% of CF developers do not use any CSS Framework, while others use Foundation at 8%, and 960Grid at 4%. The ranking for this is very similar to last year's survey. 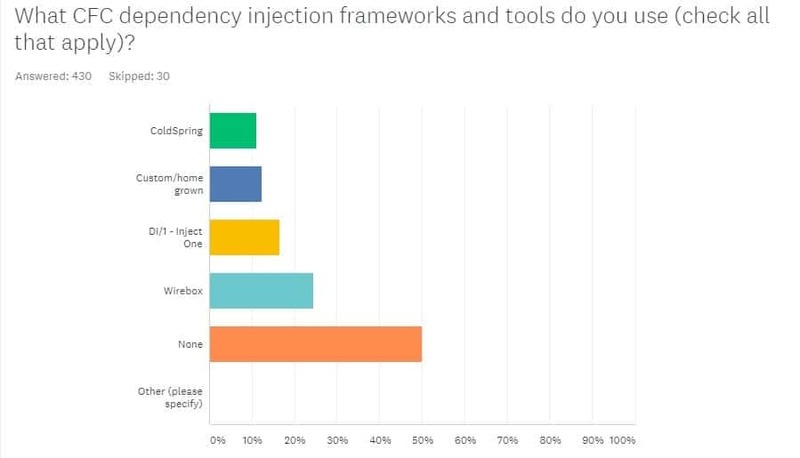 Most ColdFusion developers still do not use any CFC dependency injection framework, while Wirebox is the preferred choice for those who use one. Second place is DI/1 – Inject One, while a chunk of people use custom or homegrown CFC dependency injection framework. If you are doing object oriented CFML development I do recommend you use something for dependancy injection! Most ColdFusion developers do not use any persistence framework. This result is the same as last year's as well. 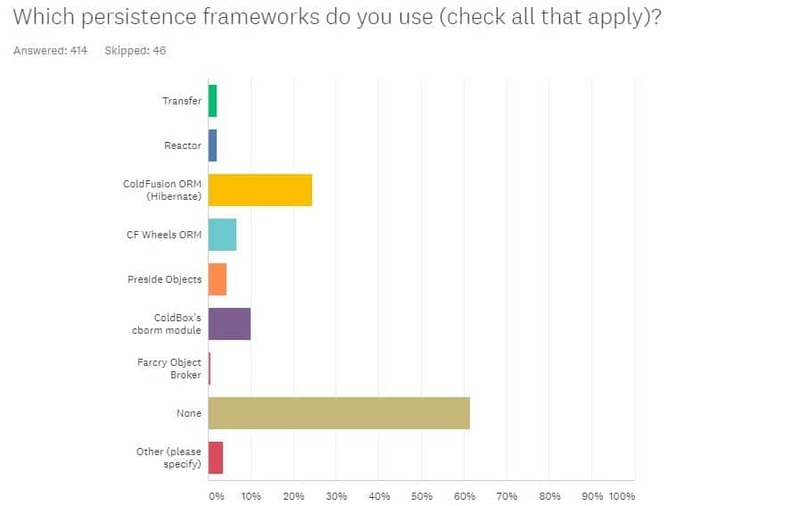 ColdFusion ORM (Hibernate) is the most preferred one, while ColdBox's cborm module is second with CFWheels ORM and Preside next. This year, 54% of ColdFusion developers still do not use any testing and mocking frameworks. This percentage is almost the same as last year's. When will they get the message that taking time to automate testing cuts down on time debugging later? TestBox is mostly preferred for those who use testing and mocking frameworks, while a number of people also use MXUnit, Selenium, Mockbox, and cfcUnit respectively. 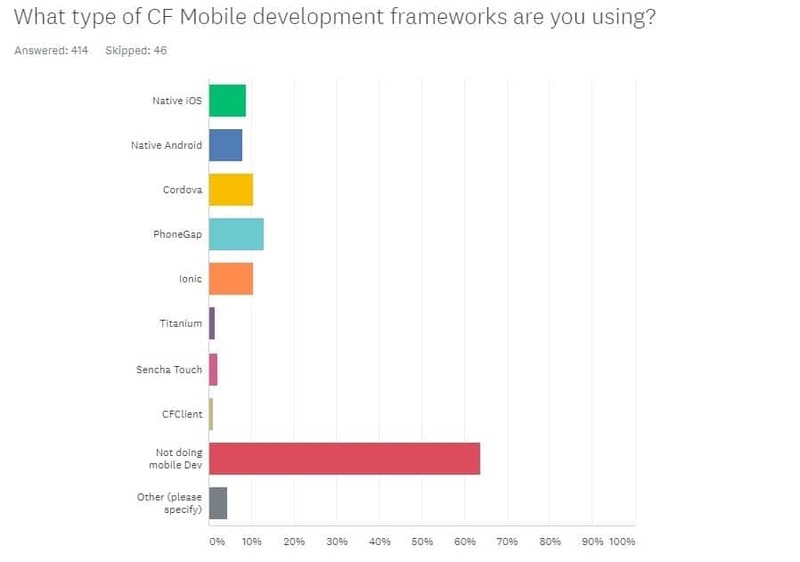 The vast majority of CF devs don't use any CF Mobile development framework. However, for those that do, the most preferred framework is PhoneGap. The second place goes to Cordova and Ionic, having both 10% votes, while there is a chunk of Native iOS and Native Android users. 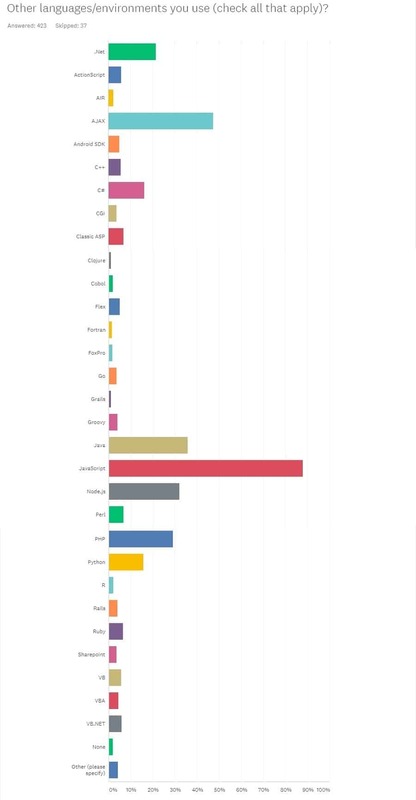 The open source CommandBox has the most CF developers using it in the miscellaneous frameworks/tools category. It gained a big 70% votes which is up over last year. Second place is ForgeBox at 26%, and LogBox at 24%. Security tool FuseGuard has around 9% of votes and DocBox got 7.5%. We got the same results as last year for this, according to the ranking. 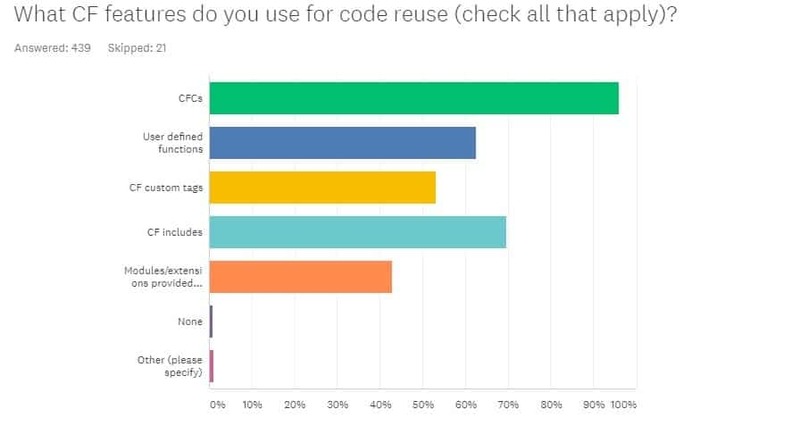 CFCs is still the most used CF feature for code reuse with 96% votes. CF includes got 69% of votes, while 63% use User Defined Functions. 53% goes to CF custom tags. 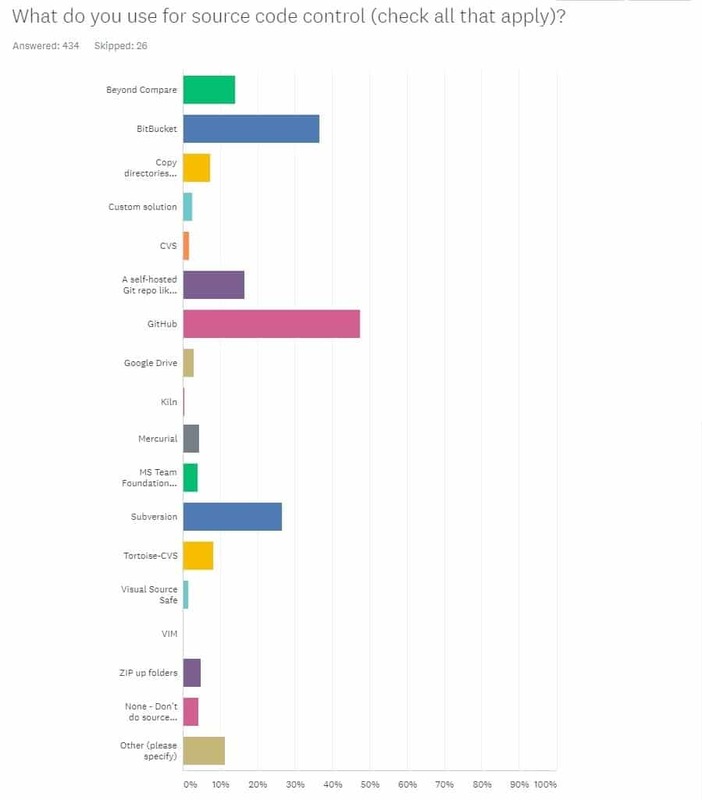 GitHub still wins this year's survey on the most used source code control. Another Git variant, BitBucket, is second. 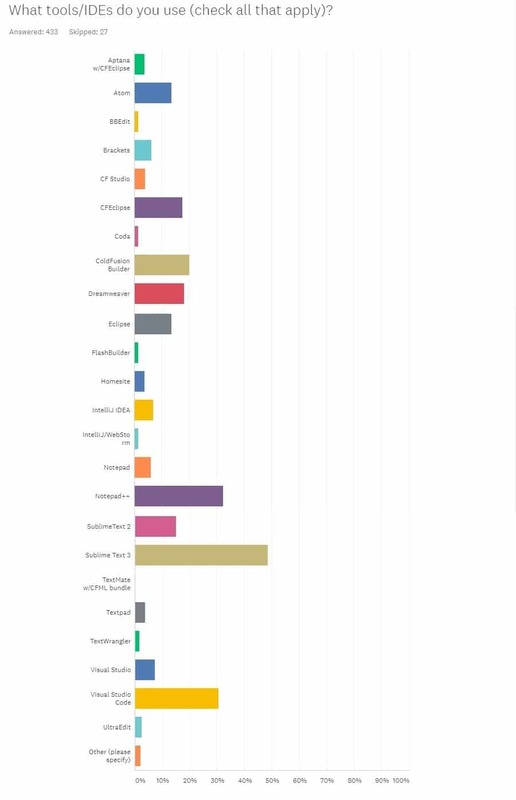 Subversion gets the 3rd place, while a chunk of people is using a self-hosted Git repo. The number of CF devs not using a source control tool is down over last year. Hurrah! The most popular editor/IDE for ColdFusion developers is still Sublime Text 3 with votes at 48.5%. 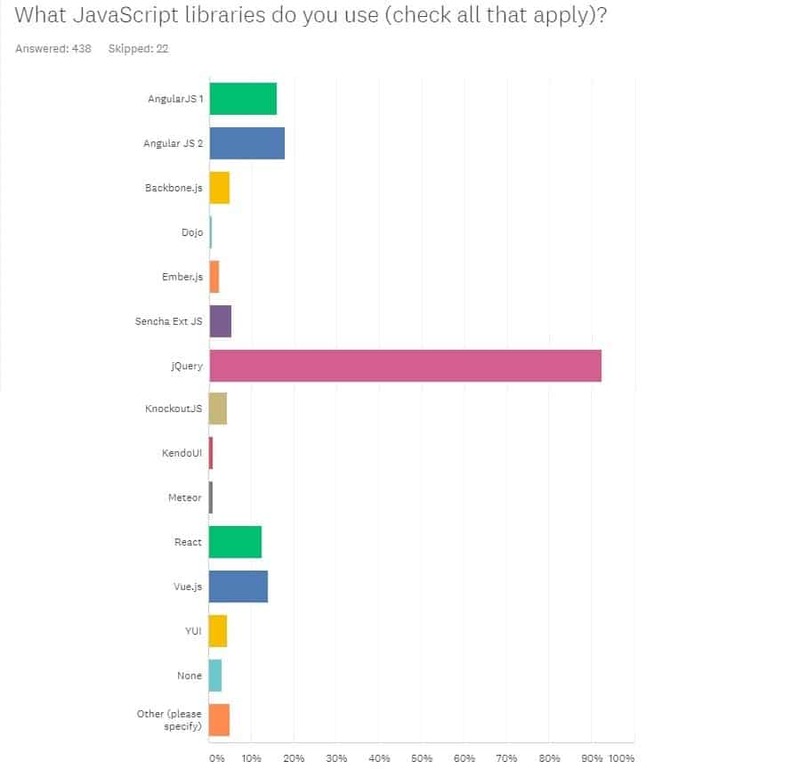 In second and third place are Notepad++ and Visual Studio Code. The Adobe ColdFusion IDEs of CF Builder and Dreamweaver are next in the pack followed by CF Eclipse. Still, most CF developers prefer to use Chrome as their browser dev tool at 91%. FireFox is at 2nd place with almost 60% votes. There are still a chunk of people using FireBug, IE Dev Tools, and Safari Dev Tools respectively. 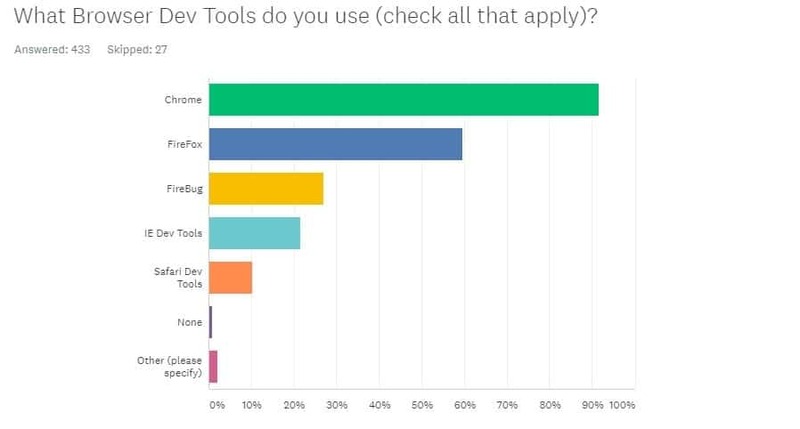 Many CFers use more than one tool, probably because they are deploying CF apps to multiple browsers. 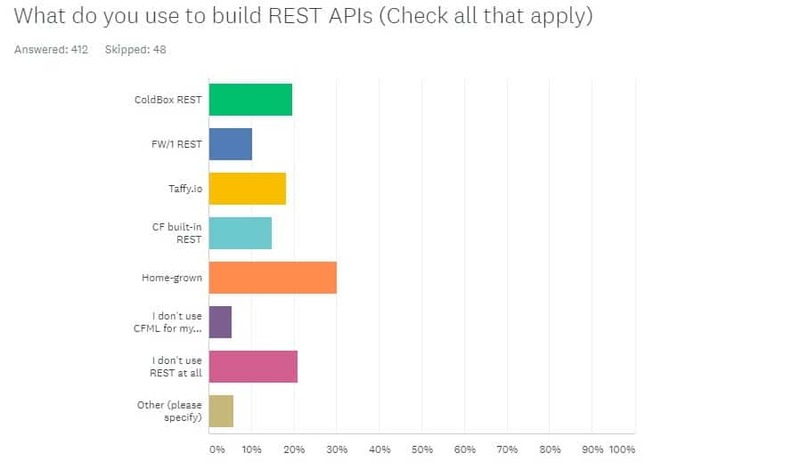 Exactly 30% of the survey participants use a Home-grown method to built REST APIs. There are 20% who don't use REST at all. For those who use REST APIs, they prefer ColdBox REST at 19%, Taffy.io at 18%, and FW/1 REST at 10%. About 15% use CF built-in REST. 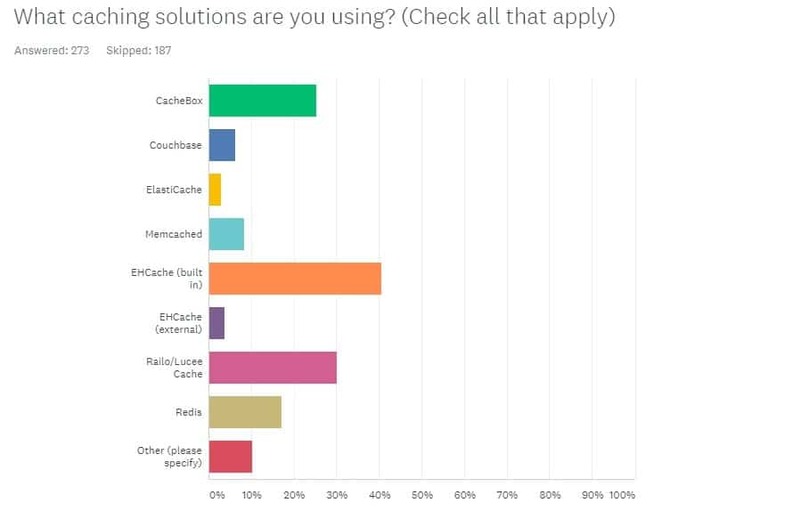 EHCache (built-in) wins the survey for this having 40% of votes from 273 people. Railo/Lucee Cache gets 30% of votes, and next to it is CacheBox with about 27% of votes. 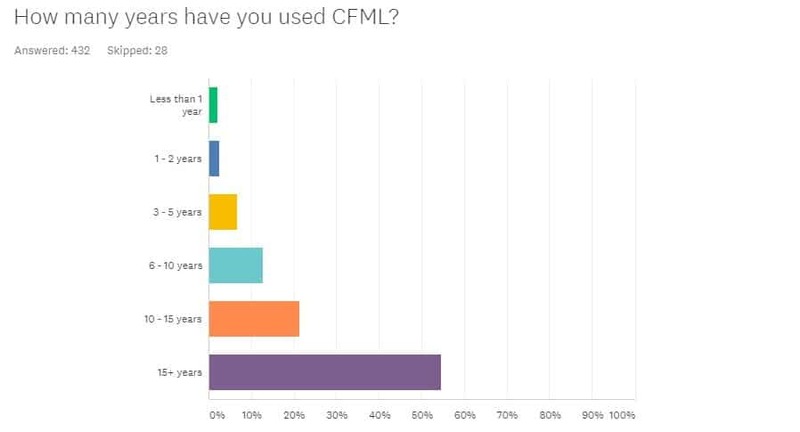 Most developers who participated in the survey have been using CFML for more than 15 years. WWIT (What Would It Take) to get more new CF developers next year? Around 38% of the CFML deverlopers have been using OO for more than 10 years. There are a wide variety of other languages that some CFers use. As of 2018, most participants have 2-5 CF developers in their organizations. The results are almost the same as last year's. Most CF developers work at organizations with 1-20 total employees. There are also a chunk of people with 21-50 employees. The majority of large organizations use ColdFusion but obviously the number of large organizations is less than smaller ones. Again, a lot of the developers do no attend any User Group meeting. Around 19% of them go to one per year, while there is still a chunk that attends two group meetings 2-5 times a year. About 3% attend 6 to 10 times per year, and 1% go to 11-12 group meetings in one year. We think that many CF devs don't live near a CFUG. And perhaps the virtual CFUGs (such as the South Florida one) can fill the gap here. A lot of ColdFusion developers prefer going to the Adobe ColdFusion Summit in Las Vegas. Others go to CF Camp in Munich, and a chunk of people go to Ortus Developers Week online, and Into The Box respectively. Let's not forget the people who attend NCDevCon, MuraCon, and Max. 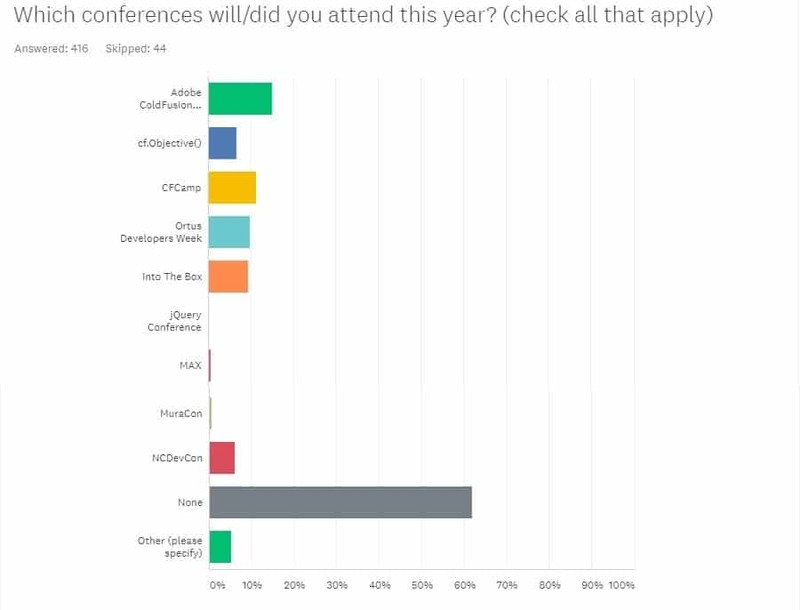 Still, more than 60% of the participants do not attend any of the conferences. They are missing out on ColdFusion learning, modern programming methods and networking with other CFers. 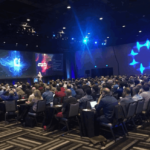 With the free Adobe CF Summit East in Washington DC this year there is little excuse not to attend at least one event this year. 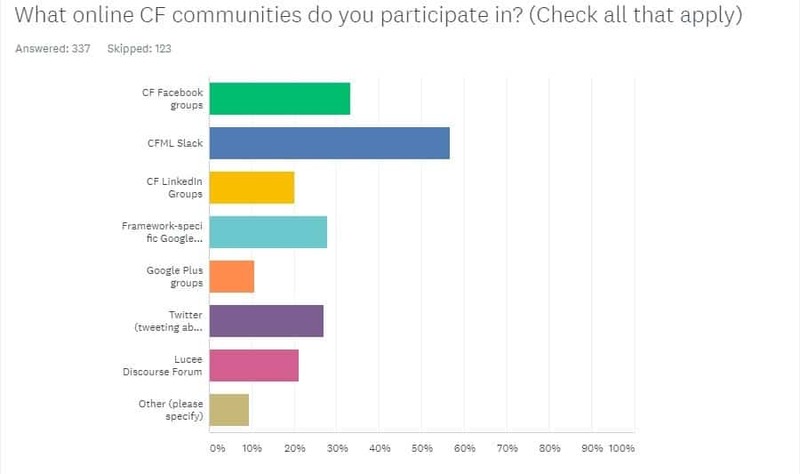 There are about 56% of the participants are in CFML Slack, being the most popular of the online CF communities. Next to it is the CF Facebook groups. 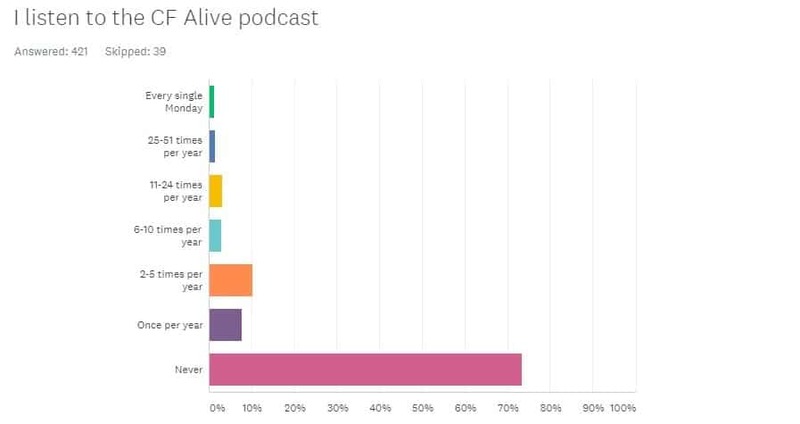 About 25% of CFers have listened to at least one CF Alive podcast episode. And 2% of ColdFusion developers listen to CF Alive every Monday! If you are in the 75% of CF devs who have not heard any of the over 60 CF Alive episodes then you may be missing out. I interview ColdFusion experts sharing their tips and solutions to CF issues. Most ColdFusion developers use a local installation for their development setups. There are also a lot using a shared development. For those who use specific development setups, however, they prefer to use CommandBox. Virtual machines are gaining in popularity and CommandBox makes doing that easy with for example Docker. 48% of CFers build their own server for production deployments. 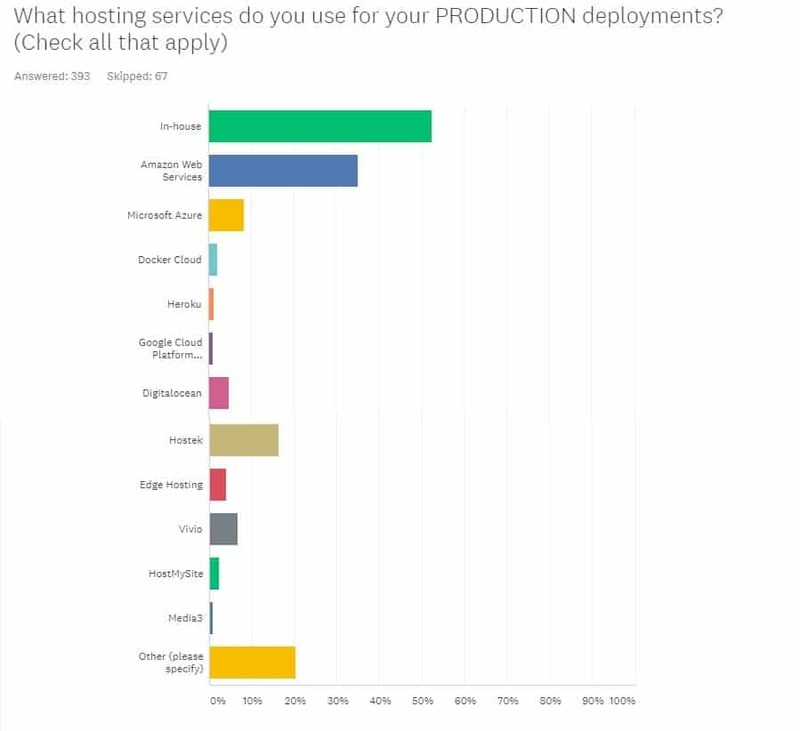 38% are using managed servers. 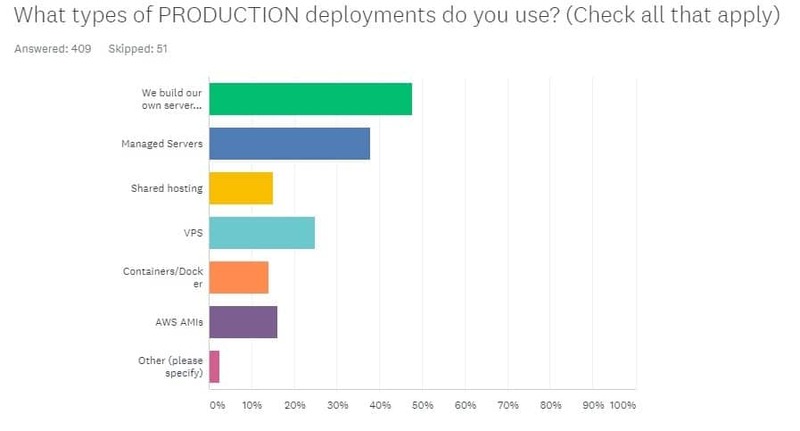 VPS is the most preferred cloud production deployment used, and AWS AMIs is the second. Docker containers are gaining in popularity. Around 52.5 % of CFML developers use an in-house production deployment for their ColdFusion projects. ColdFusion Cloud hosting is catching up fast with 35% using Amazon Web Services. Microsoft Azure, Google Cloud Platform, Docker Cloud, Digital Ocean and Heroku in the cloud hosting group. For commercial ColdFusion hosting the leader is Hostek, with Vivio, Edge Hosting, and HostMySite behind them. 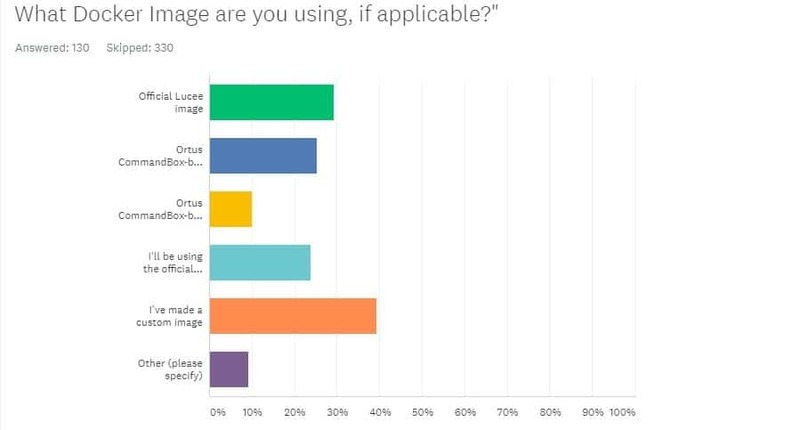 39% of CFers who do Docker deployments use a custom image. Around 29% are using an official Lucee image, and next to it is Ortus CommandBox at 10%. I am looking forward to Adobe's offical CF Docker image and licensing (hopefully later this year). Meanwhile if you are just getting started using Docker for deploying your CF app then the free CommandBox makes getting and using a wide variety of ColdFusion docker images very easy. 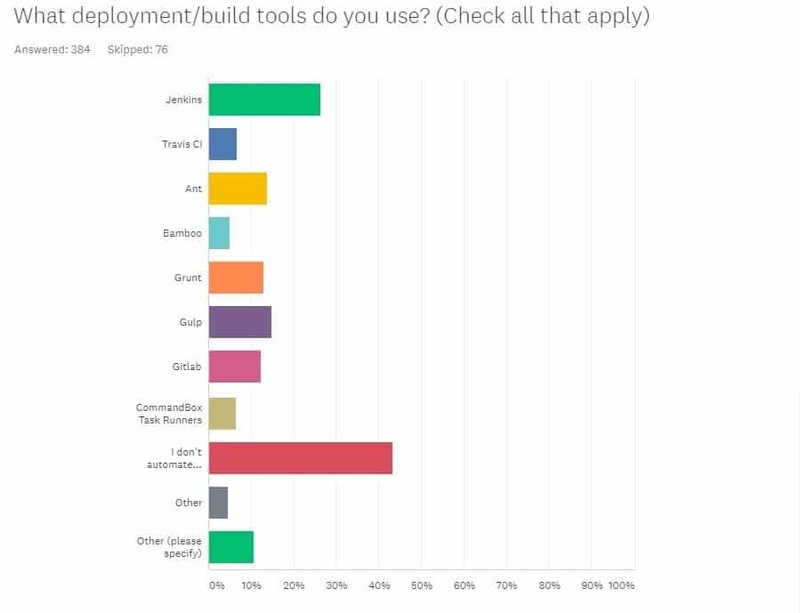 About 44% of ColdFusion developers do not automate or use any deployment or build tools. Of those CFers who do automate builds the most popular is Jenkins, gaining around 28% of votes. There are a wide variety of other options used by less than 10% of CFers including Gulp, Grunt, Gitlab, Travis, Ant, Bambo. If you are not automating your builds you are missing out on saving time and improving your deployment and testing process. 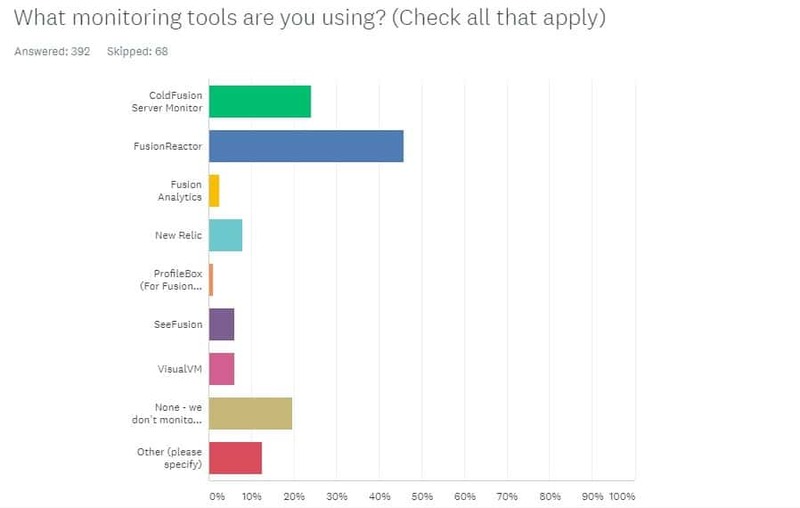 FusionReactor is still the most popular monitoring tool used gaining around 46% of votes. ColdFusion Server Monitor gained 25% of votes. There is also a chunk of developers who do not monitor their CF projects. Bad idea if you want a fast and reliable CF app! 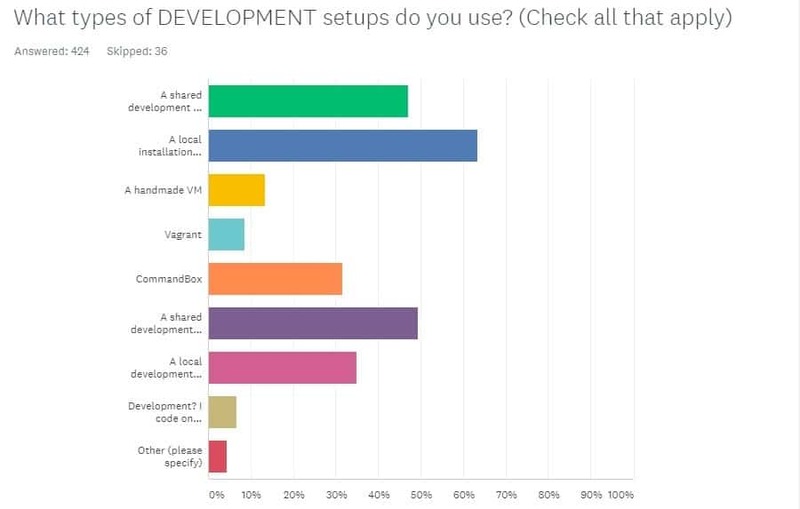 54.5% of ColdFusion developer participants use the official local lockdown guides. About 37% of them have ops people who handle their security. Slightly more than 36% implement their own security protocols. There are about 14% using the “secure profile” in Adobe CF. 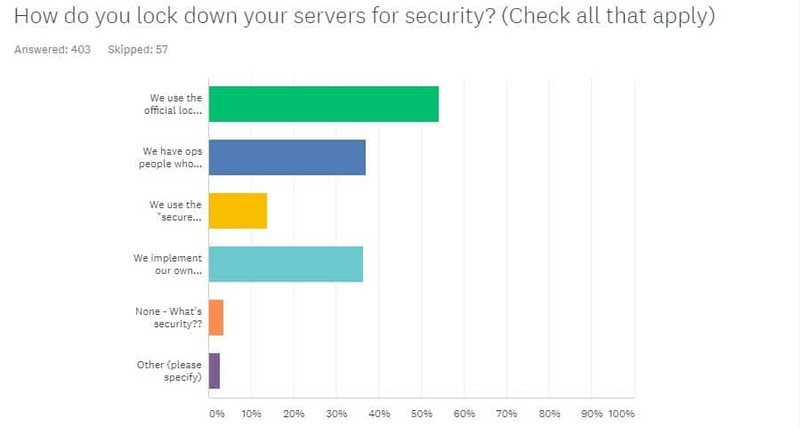 I am glad to see that less than 3% don't do and security measures. FYI other security measures include the commericalsecurityCF securty tool and FuseGuard. 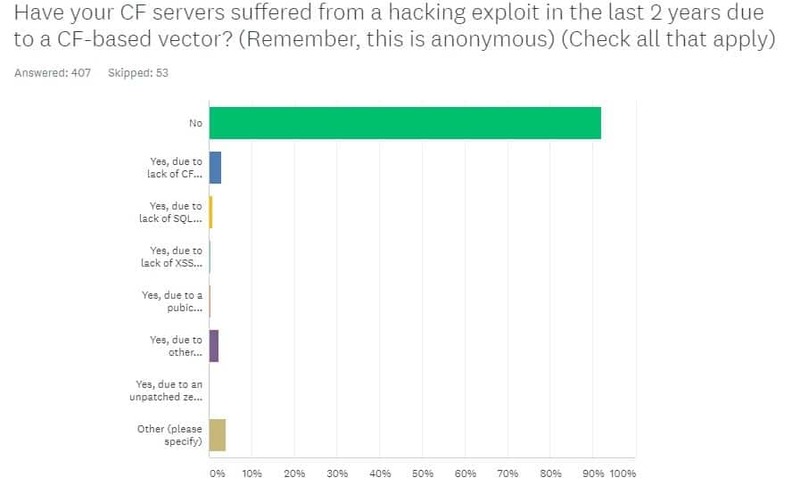 Most of the developers answered that they have not suffered from a hacking exploit in the last two years due to a CF-based vector, gaining 92.3% of votes. Glad to hear that! Of those who do know they were hacked most were due to lack of CF patching or vulnerable CFML code. Less frequent causes of CF security breaches were cross-site scripting, SQL injection, public CF Admin URL. Unpatched day zero hacks were very rare (Adobe has not had one of these in over 4 years so those that had them must have been running older versions of CF that were not patched). Rapid development is the main aspect keeping most of the CF developers in using ColdFusion. This is the 73% of the participants. There are also 56.7% of them who says that prior investment in CF is too large to rewrite. 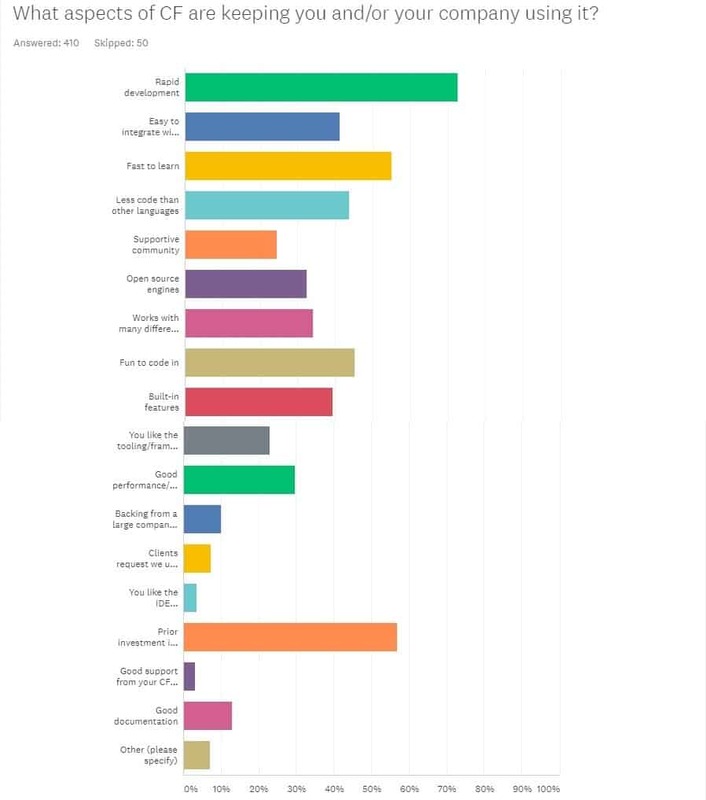 About 55% say that it is fast to learn, and 44.7% say it is fun to code with. So why are companies not fully embracing ColdFusion? Almost 72% of the participants say that is is because it's seen as dying/legacy. At the CF Alive podcast we are commiting to changing that this year! 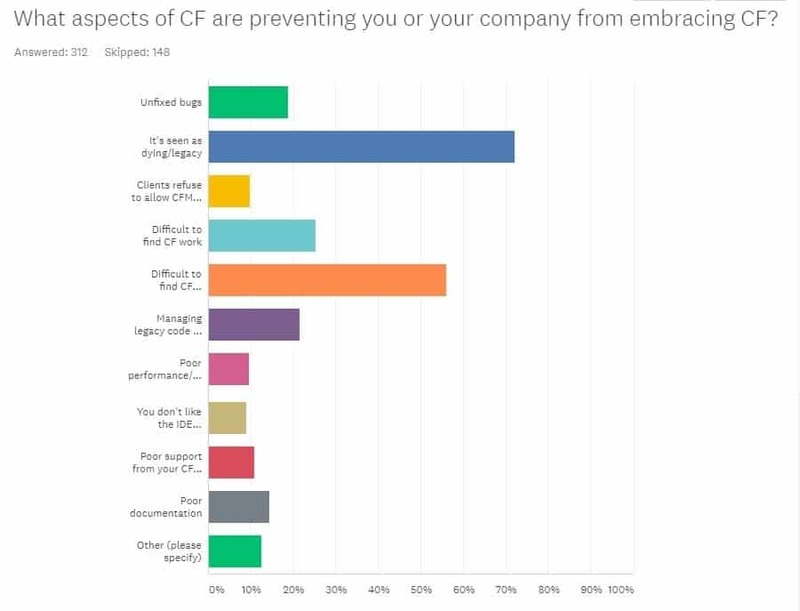 56% say that it's difficult for them to find CF developers. 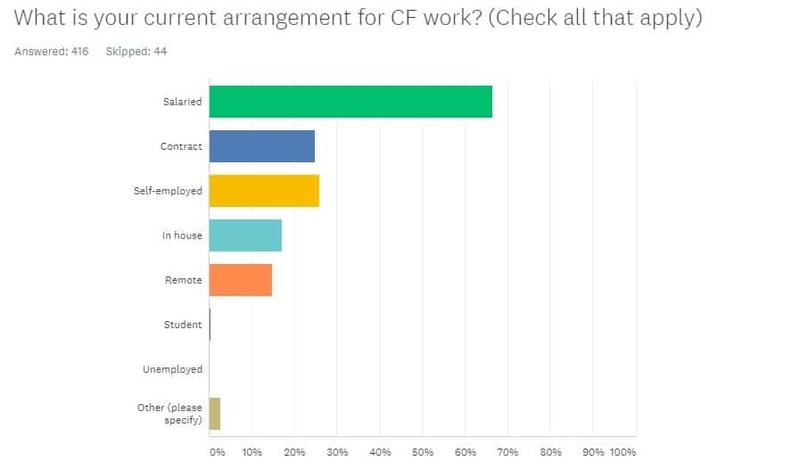 There are 25% saying it is difficult to find CF work these days. Almost 12% of ColdFusion developers earn $95k-105k each year, while there are 11% earning $75k-$85k. These are the most common segments. At the top end of the pay scale there is 0.25% being paid $175k-$185k a year and 3% over $200k. More than 67% of the ColdFusion developers are salaried, meaning they are working for a company. About 26% are self-employed, and there is a chunk of them under contract, at almost 25%. 16.75% are in-house, and 14.64% are working remotely. There are 42% of the participants spend CFML 75% of professional development. About 27% are doing it full-time, while 16.6% is doing it 50% of their professional development time. It is very interesting to find that there are 13.08% of the participants doing CFML for just 100% hobby. There are 22.2% who do not develop as a hobby at all. These were very interesting results of the State of CF Union Survey for 2018. Again, we appreciate everyone who took the time to take the survey. Until next year!